The IVEM-Tandem Facility is a DOE-NE user facility for in situ TEM studies of defect structures in materials under controlled ion irradiation and sample conditions. Learn how to submit a proposal to use the facility. 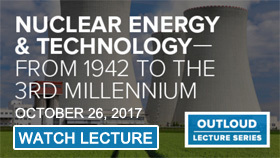 View the recent Argonne OutLoud lecture describing the journey nuclear energy has undertaken and what the future of nuclear energy may look like. Argonne has been involved in the development of nuclear power since the dawn of the nuclear age. Argonne’s Nuclear Science and Technology Legacy is a fascinating compilation of short articles and historical news releases covering Argonne's nuclear energy legacy, from the world's first nuclear reactor to the present. Nuclear Energy Resources for Home and School - Argonne nuclear energy experts help students and educators locate accurate, up-to-date information on nuclear energy related topics. Argonne’s Nuclear Engineering (NE) division works to advance nuclear energy as a proven, sustainable non-carbon energy source through research, technology development, design, and analysis applied to current and emerging programs of national and international significance. Argonne has led the development of civilian nuclear power systems since the dawn of the nuclear age. We provide the national leadership for the US Department of Energy’s — Office of Nuclear Energy (DOE-NE) Advanced Reactor Technologies R&D Program, which is advancing the technologies and design of future-generation nuclear reactor systems. We contribute technical leadership and expertise in several areas of DOE-NE’s fuel cycle R&D program, including the assessment of future fuel cycle options; safe management and disposition of used nuclear fuel, recovery of material from used fuel for recycle to advanced reactors, and development of improved fuels for light water reactors (LWR) and advanced reactors. National Nuclear Security Administration (NNSA) and other federal agencies. Other areas we conduct R&D include research reactors, advanced sensors and instrumentation/controls, nuclear material package certification, modelling and simulation, and materials research, including operation of the Intermediate Voltage Electron Microscopy (IVEM) — Tandem User Facility for DOE-NE. Finally, we apply our expertise to such diverse areas as fuel cell technology and the oil industry, plus we engage in a number of international collaborations with the IAEA, INSP, and others in support of our mission.